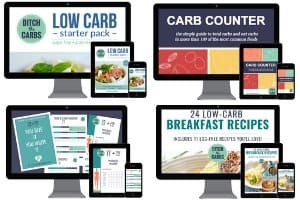 This 7 Steps To Break A Weight Loss Plateau is a guest post by Dr. Brittanie Volk, a registered dietitian, scientist and a senior clinical & patient engagement specialist at Virta Health, the first company with a clinically-proven treatment to reverse type 2 diabetes and other chronic diseases without the use of medications or surgery. The rate of weight loss varies greatly from person to person. When on a low-carb diet, many people experience periods of weight loss followed by periods of weight stability. 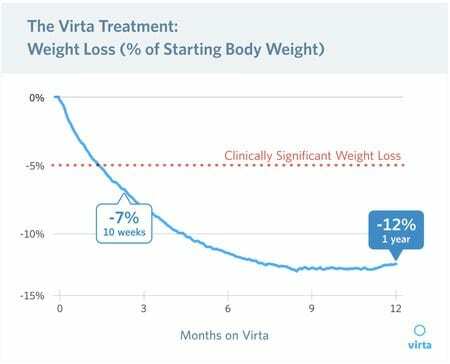 The 1-year results from Virta’s clinical trial show that the average patient experienced 9 months of consistent weight loss, then three months of weight stability, despite continued carbohydrate restriction. A low carb diet has many benefits in the body beyond weight loss, including improved blood sugar control, improved cardiovascular markers, and even diabetes reversal (Hallberg, 2018). Even if your weight loss is stalled, you’re likely still experiencing these benefits. 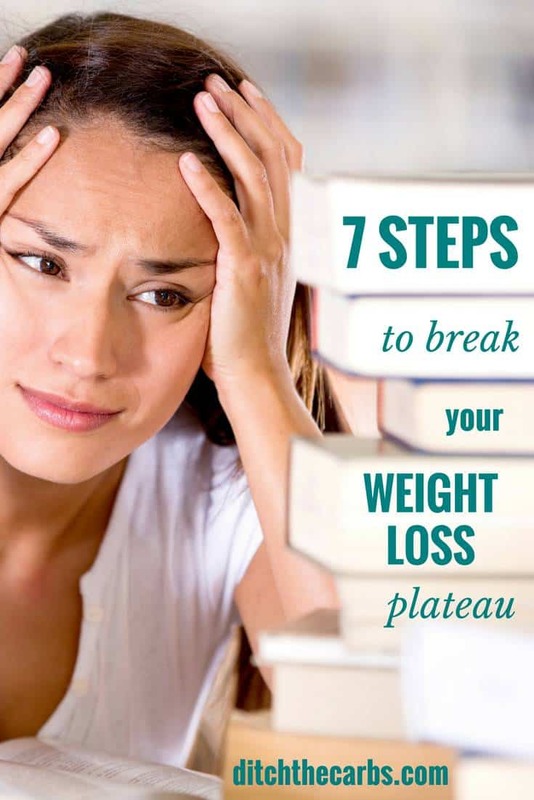 If you think you might be hitting a weight loss plateau, here are 6 steps to determine what’s causing it. What differentiates a natural, normal period of weight stability from a weight loss plateau? Your weight varies day-to-day because of normal fluctuations in body water, so you need to look at your weight from month to month or week to week, not day to day. Have you been weight stable for more than three months? If it’s been less than three months, this may not be a true plateau. (note: There is no standard length of time that defines a weight plateau.) It may just be part of the normal weight loss process, and weight loss may pick up again shortly. 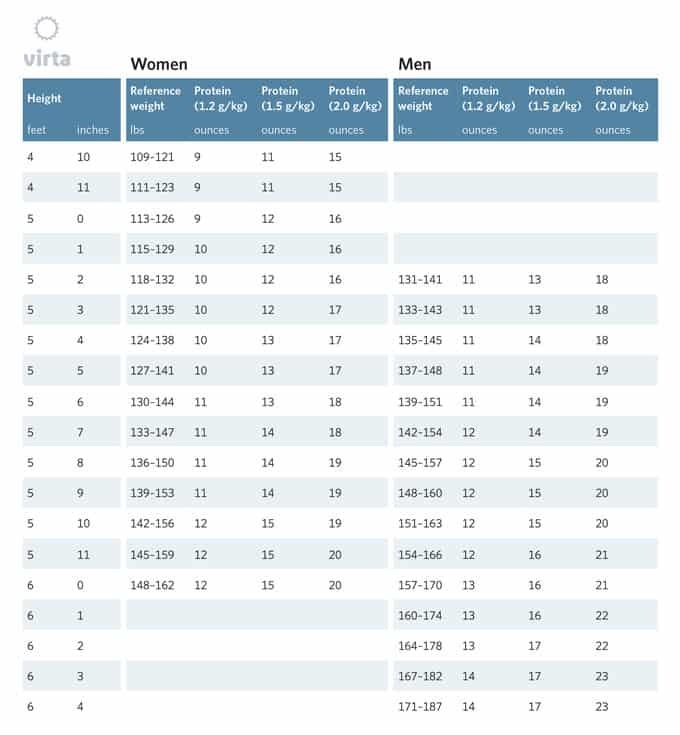 Has your body composition changed even though the numbers on the scale are the same? Notice how your clothing fits, and measure your waist circumference. Don’t let the scale be your only measure of progress—if your body is still changing, it may not be a plateau. If you’ve identified this as a true weight plateau, move on to the next step. We recommend trying to initially keep your total grams of carbs to under 30 and always under your level of carb tolerance. When we’ve been staying with a way of eating for a long time, it’s easy to become more lax. There are plenty of ways for total carb intake to creep up. Even though you might be avoiding starchy side dishes and sugary desserts, make sure to check for hidden carbs in sauces, condiments and thickeners, especially at restaurants. And carbs can even add up from low-carb foods like nuts and non-starchy vegetables. Test and monitor your glucose to identify your carb tolerance, and make sure to stay below that level. Track your portions to identify total carbohydrates. If you were losing weight consistently when you were more closely tracking your carbohydrate intake, a reset period of going back to counting can make a big difference. Read the nutrition label closely and look at the ingredients list to make an informed decision. Ask about the hidden sugars and carbs in sauces and condiments at restaurants. It’s easy to fall into the habit of overeating protein and underestimating protein portions. Too much dietary protein can drive down ketone production (Marliss 1978) when consumed in excess of our body’s needs. Read more about this in this deep dive on protein by myself, Dr. Stephen Phinney, and Dr. Jeff Volek. Your protein consumption should fall into this range. This chart shows protein in terms of ounces of protein-containing food, and each ounce typically contains about 7 grams of protein. If you’re finding yourself hitting a weight plateau when your carb intake is below your personal threshold and your ketones are consistently below 0.5 mM, try lowering your protein intake to the low end of your recommended range. Test and see the results. Keep an eye on your snacking. Are your snacks protein-heavy, like nuts or cheese? Protein can creep up, especially when fat intake is inadequate and you find yourself snacking out of hunger. Incorporate fats like butter or olive oil for satiety. If it’s difficult for you to add fats and keep your protein intake moderate, think about if you fear adding fat. Getting over this fear can take time! If you’re trying to lose weight, your body should be partly relying on its own body fat for energy, If your dietary intake of fat is high, you may be preventing your body from relying on its body fat. How do you know if you’re consuming too much fat? The goal is to add enough fat (butter, oil, cream, etc) to your protein and vegetable sources at meals to ensure you’re not hungry between meals. However, fat is not a ‘free’ food, and calories still matter. Assess how much fat you’re adding to your meals and beverages and try reducing the the amount. See if if has any effect on your weight, and make sure to note any changes in your hunger levels. If you feel hungry, then you have probably reduced your fat intake too much. You’re looking for the level of fat intake where you’re not hungry, but your body is able to rely on its own body fat for energy. For some people, just one or two drinks can impact weight loss. Alcohol provides calories without satiety. And beyond the calories, alcohol interferes with the digestion and utilization of other nutrients, including fat. Consider the type and the volume of alcohol you’re consuming. The carbs and calories can add up, and consuming alcohol can make us more susceptible to snacking. Switch to low carb alcohols—use this guide to low carb alcohols to identify which drinks you can have. Track your alcohol type and volume to identify patterns, including any cravings or snacking that happens when you drink. Cut it out completely for the moment. Food is often a source of comfort. It’s easy to grab a bite to eat for reasons other than hunger. Sometimes we eat out of habit or as a social behavior, or we’ll eat out of emotion (or out of avoiding emotions). Practice mindful eating (being aware and present when you are eating). This can help you ensure you’re not eating out of boredom or habit or escapism. There is more to your health and quality of life than the number on the scale. (Though, it’s okay to say that weight loss is important to you.) Do you have more energy than you used to? Are you less dependent on medications? If your weight has been stable, but you feel energetic and strong and have achieved increased blood sugar control or other notable health improvements, it might be time to revise your goals or revise your timeline. For now, focus on feeling well and functioning well. You might be surprised at the changes you experience when you let how you feel be the marker of your success, not how much you weigh.